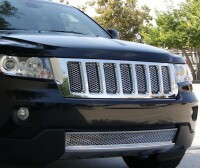 514-039-2-19: 11-13 Jeep Grand Cherokee (Not SRT) Diamond Cut Chrome Mesh Grille Insert. This custom grille insert makes a very attractive upgrade to your Cherokee! Made from high quality expanded steel mesh, the grille insert comes triple chrome plated for a lasting chrome sparkle that perfectly matches the OEM chrome. Installs from behind the OEM factory grille and comes complete with hardware and installations instructions. Install time is about 30mins with regular home tools. (This does not include the complete grille frame and is the instert only.) Backed by manufacturers 3yr warranty which includes chrome finish. Matching bumper grille is also available above as additional item (bumper grille does not fit SRT models.) Quality made in the USA. Tell your friends about the Diamond Cut Chrome Mesh Grille Insert. Share this product on Facebook, Twitter, MySpace or send an email to a friend!